Problem Solved are a small family run business based in Teviothead near Hawick. 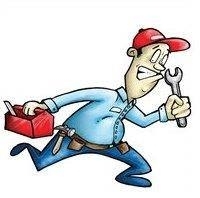 Our handyman has over 20 years experience in the Building / Maintenance and Caravan sectors. We believe in doing :- A Quality job at a Fair price and Pride ourselves on being Competitive, Reliable and Honest. We cover up to 35 miles depending on the job. Our Handyman has experience in a wide variety of trades. We can fit smoke / Co2 alarms, security bolts / locks and chains, wireless cctv and door bells. We do painting, plumbing, joinery, basic glazing, erect / build shelves, sheds, decking, fences and gates. We can fit blinds, hang pictures, fit cat flaps, grab rails. Assemble / move furniture, general gardening / lawns. Basic tiling, plastering, electrical work and many more jobs We also do Landlord property maintenance work. Problem Solved Handyman says it in the name. We can do most jobs the bigger businesses do not want to do. Please give us a call. We are happy to help.